The Office of the Archives collects and preserves documents, photos, records, and other materials that pertain to the origin, history, and administration of the archdiocese. We provide assistance and support to archdiocesan offices, parishes, and individual researchers. With a few exceptions, sacramental records are kept in the parish where they originated. Confirmation records for celebrations at Saints Peter and Paul Cathedral are also kept by individual parishes. If a parish is closed, its sacramental records are ordinarily transferred to a neighboring parish. 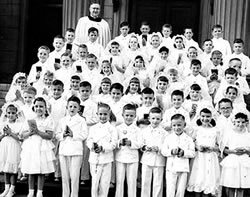 Contact information for all active parishes and missions is available at www.archindy.org/parishes. Please contact the archives staff for information about closed parishes. A copy of the Sacramental Records Handbook can be downloaded by clicking on the link below.